The Apple iTV has remained nothing more than a hushed rumour since it was first talked about back in 2009, since then we've had numerous new versions of the iPhone, iPad and even a new thinner iMac. That hasn't stopped the rumour mill from turning and with the company now looking at a change in direction the Apple iTV could be the flagship for Tim Cook and Jony Ive's brave new Apple. With no leaked images and even less in the way of hard evidence the iTV has remained a constant source of interest not least because of the reputation Apple has with taking an idea and then putting their own spin on it. Whilst attention has firmly been focused on the upcoming iPhone 5S and iPad 5 it seems as though Apple are far from giving up on their next-gen TV proposition with patent reports suggesting that the company is in fact now in talks with major manufacturers with the aim to start producing the Apple iTV. Nothing so far in 2014, with Apple's WWDC passing by with no mention of an iTV. With a keynote event expected in September this year, there's a slim chance we might see some spanking televisual goods, alongside other expected product launches like the iPhone 6. In a strange twist the latest news to land about Apple's rumoured iTV is that it may not happen at all. Following a new book by former Apple reporter Yukari Iwatani Kane, Kane notes that when asked about the idea of Apple making a TV set Steve Jobs was utterly against the idea, even when the HDTV market was considered 'healthy'. Whilst it's true that many things have changed at Apple since Job's passing it's clear that analysts are beginning to be very skeptical about Apple's involvement in the sector with IHS consumer devices analyst Jusy Hong pointing out that the HDTV market is now in a state of fairly steady decline with growth dropping by six per cent year after year. That said it's hard to argue with the Apple's CEO Tim Cook who recently offered the closest indication yet that the iPhone and iPad maker is planning to out a full television service. Speaking to NBC News, Mr Cook confirmed the TV market was "of intense interest," to the folks at Cupertino. Speaking earlier this year at the Goldman Sachs Technology and Internet Conference, Cook described the current Apple TV offering as a 'hobby', whilst revealing Apple shifted just shy of 3 million Apple TV units during 2011, 1 million of which came in the year's final quarter. Stating that Apple “doesn't do hobbies as a general rule,” Cook revealed that the existing Apple TV unit was testing the waters of the television sector stating the company would need something “special” in order to make TV a “serious category” for Apple. As if to confirm this skepticism Ming-Chi Kuo, an analyst at KGI Security has claimed that the Apple iTV release date won't be until 2015, presumably so Apple can focus on the iPhone 6 and the upcoming iWatch that many believe will finally land next year. Jefferies analyst Peter Misek claims he saw "early production evidence of iTV" on a trip to Apple manufacturing plants in China during the summer. Suggesting Apple will produce between two and five million units ready for a launch. Misek said the manufacturer would introduce a number of "specialty components" to the process. Adding to this onslaught of speculation is the latest news from the Wall Street Journal that Foxconn and Sharp are currently developing prototype designs in Asia. An unnamed source inside one of Apple's suppliers apparently told the WSJ that the companies were working on a number of prototypes but that: “It isn't a formal product yet. It is still in the early stages of testing”. According to the Telegraph Apple recently just bought Matcha.tv an online TV guide and recommendations service which is designed to both increase the amount of new content you watch but also to make it easier by flagging TV series for on-demand viewing if you missed it live. At present many are pondering as to why Apple has bought this company however there are those that believe the decision is one which will be used for Apple iTV helping users find new content whilst also integrating it with iTunes. A new patent has also been revealed showing that Apple is working on a new construction technique which will see Corning's utlra-strong glass fused with the body of a TV or iMac making it much stronger whilst allowing it to be much thinner. This process was orginally used on the iPhone 4S however the Apple iTV is a considerable amount bigger which probably explains why it's taking Apple so long in their efforts to upscale the technology. Far from a simple television set, Apple iTV is set to land as a home entertainment hub with the internet-connected units to allow users to sync their iOS and Mac devices via the company's iCloud service. "Apple's ability to deliver hardware, software and content that could replace an entire entertainment system with a single TV, puts Apple in a unique position for the emerging connected TV cycle," says analyst Gene Munster. “Apple already has several of the key ingredients for success in the connected TV market, many of which would differentiate Apple from current market players." With the iTV systems set to follow on from the current Apple TV service Apple is said to be readying the simultaneous arrival of an enhanced iTunes based content service to fill user's systems with the latest television and movie based content at times of their choosing. Said to follow in the footsteps of the iPhone, iPad and iPod Touch, Apple is reportedly planning on incorporating iOS into its iTV units with the mobile-friendly operating system allowing users to make readily available use of the abundant array of applications. Further enhancing the cross device collaboration, reports have suggested Apple is to produce a number of applications that will allow users to utilise their current iPhone, iPod Touch or iPad devices as remote controls for their new Apple branded televisions. 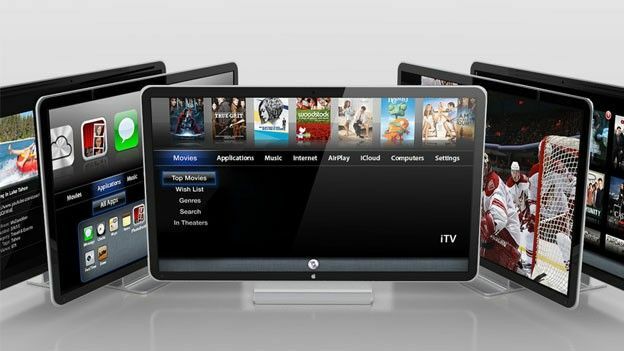 Currently unknown is whether the Apple iTV units will connect to the web wirelessly or through cabled means as well as whether the television sets will feature an inbuilt harddrive to allow users to store content for offline viewing. More than a simple well designed box that will sit in the corner and display the usual array of terrestrial and digital broadcast content, Apple is rumoured to be planning a hefty content offering for the release of Apple iTV much like the iTunes music collection made available for the iPod or the App Store that services the iPhone and iPad. Whilst Apple has been linked with paying for the rights to exclusively broadcast a selection of English Premier League football matches, further reports have suggested the company is looking to source and create custom programming to offer users their own personalised content channels. The rumours around a new Apple content stream have seen a lot expected from the Google rival. "We believe that Apple only enters mature markets with the goal of revolutionizing them, as it did with the smartphone," Gene Munster, Managing Director and Senior Research analyst with Piper Jaffray explained. "Without a revamped TV content solution, we do not think Apple enters the TV market... Apple enters markets to reinvent them." Whilst the company has repeatedly shown its ability to turn digital content channels into vast amounts of money, Apple is reportedly facing a number of stumbling blocks in its attempts to tempt content providers to support the upcoming Apple iTV platform. “A major roadblock for Apple along the way has been securing content needed to make an iTV succeed,” an unnamed insider source and former Apple employee told American news outlet USA Today in a recent interview. Set to be made available with a variety of screen sizes Apple is reportedly targeting a number of end user needs with iTV units set to kick off with a 37-inch model. Whilst a 42-inch Apple iTV setup has also been leaked by retailers, a claimed anonymous Apple employee has suggest that the company's design guru Jony Ive is personally putting the finishing touches to a 50-inch Apple iTV model. “Inside the locked-down studio of Jonathan Ive, senior vice president of industrial design at Apple, there's a slick 50-inch TV,” the insider claimed. Although there is still a little confusion as to exactly what form the Apple iTV release will take, the possibility of an Apple television set has sparked much excitement with industry analysists and even the company's own co-founder. "I do expect Apple to make an attempt [at launching its own TVs and television service]," said Apple co-founder and company ex-pat Steve Wozniak in an interview with USA Today. "I expect the living room to remain a centre for family entertainment, and that touches on all areas of consumer products that Apple is already making." Remaining the retailer with a reputation as leaky as a colander, Best Buy in the US was the first to offer an insight to the much coveted Apple iTV price with the Apple television sets appearing on a retailer customer survey. Announcing "Apple finally reinvents what a TV can do," the Best Buy survey eaked a flurry of the upcoming television set's features as well as offering the first indication of the speculative Apple iTV price. Landing with a price comparable to some of Apple's MacBook and iMac offerings, the Apple iTV price has been leaked as $1,499 (£947) for the 42-inch model that is said to come boasting an integrated camera and access to streaming services such as Netflix, YouTube and Flickr.